If you watched the 57th GRAMMY® Awards, you probably caught the history-making Target commercial featuring a live – yes, live – performance by Imagine Dragons. In the first live commercial in the history of the telecast, Target gave up its commercial time to give guests exactly what they want: #moremusic. 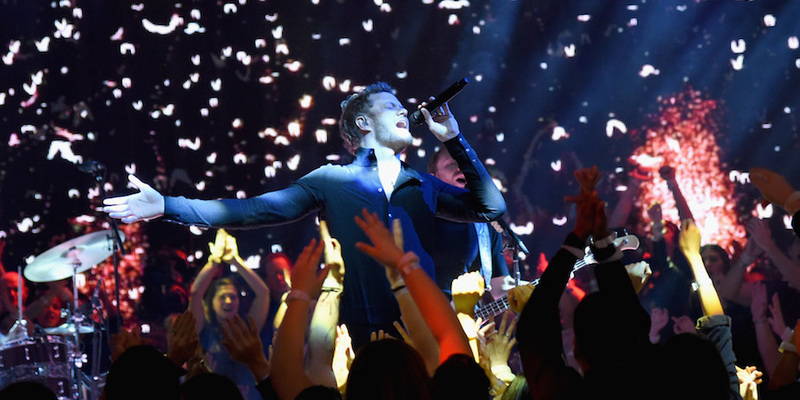 Lighting up a Las Vegas stage, band members Dan Reynolds, Daniel Platzman, Ben McKee and Daniel Wayne Sermon rocked out in front of a screaming crowd of “firebreathers” aka super-fans (not to mention tens of millions of viewers tuning in from home). While the Vegas natives’ performance – directed by Jonas Åkerlund – clocked in at just four fiery minutes, it took more than 22,000 man hours, 2,500 square feet of LED lights, 575 people, 15 semi-trucks and more for Target and Imagine Dragons to pull off the rockin’ act. (The whole set — crew, audience and gear — weighed 190 tons!) Take a look at the exclusive behind-the-scenes time-lapse video below to see the full stage come together in just 77 seconds! Did the live spot leave you wanting more? We thought it might. The band’s second partnership with Target will deliver more music than ever before with a Target Exclusive Edition of “Smoke + Mirrors” featuring special cover art and four dynamite bonus tracks: “Thief,” “The Unknown,” “Second Chances” and “Release.” Smoke + Mirrors hits stores Feb. 17, but you can preorder the album on Target.com now! If you’re one of the fans who witnessed Target’s Snapchat debut, you probably caught a glimpse of Imagine Dragons in their first Snapchat story. If not, go follow Target now (username: target)!